Beads made of fabric. Fabric beads can be customised as per your requirement. Focusing on the international fashion spectrum, Aabhushan bring forth a stylish and designer collection of semi-precious beads Necklace which are processed using premium quality glass. High quality beaded Scarf Necklace. Any customized design/development/manufacturing is happily entertained. We at Ethnic regalia take care of every piece of jewelry so that you don't need to spend hours caring for them. But do remember, fashion jewelry lasts longer when kept dry and free of chemicals. Follow this simple rule: Your jewelry should be the last thing you put on and the first thing you take off. We are involved in offering a wide range of Colour Full Beads Necklace to our most valued clients. 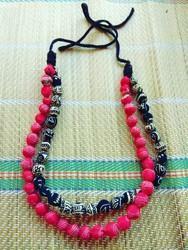 Our range of Colour Full Beads Necklace is widely appreciated by our clients which are situated all round the nation. 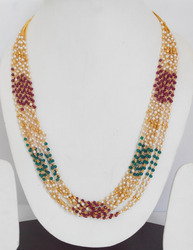 We offer our range of Colour Full Beads Necklace at most reasonable prices.